I’ve been craving lamb a lot lately – not sure what’s behind that … maybe oncoming Spring? Is it possible to have Spring when one’s Winter doesn’t dip below 50 F? Whatever it its, I’ve been wanting some slow cooked carnitas-style lamb in my life and recently found an electric pressure cooker — unfortunately not an Instant Pot since those don’t exist in this country yet, but it does the same thing. Add 2 Tbsp. fat of choice to a large pan over medium-high heat. Salt and pepper the lamb liberally on all sides. Add the lamb and brown on 3 out of 4 sides. While cooking, mince the shallots and garlic and add when you’re mostly done with the lamb. Sautee until the lamb is browned and the aromatics are soft. Hit with a little salt and pepper. Add to your pressure cooker with the rest of the ingredients and set the timer for 50 minutes. When your lamb is done cooking, release the pressure, pull the lamb, and shred with forks. You will have a lot of liquid left over – make a pan sauce by reducing in a saucepan by half or so if desired. I was too lazy and was really craving gremolata. 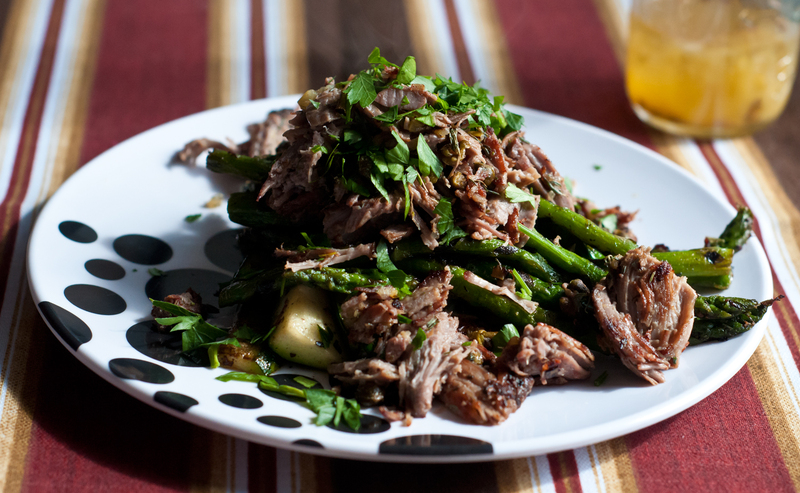 Chuck the shredded lamb under the broiler with 1-2 additional Tablespoons fat for 5 – 7 minutes or until browned and crisped up a bit like carnitas. On to the gremolata. Blend all the ingredients together. Pour over the lamb. This is fantastic served with leftover spaghetti squash reheated and fried a bit in a little butter, salt & pepper. Spaghetti squash can also be cooked in the pressure cooker – and quickly. I think it took 15 minutes? Nom Nom Paleo has an easy recipe. This quick and tasty lunch was a great way to use up some leftover slow-cooked lamb leg I had lingering in the fridge from earlier in the week. In a large pan, heat 1 Tbsp. coconut oil over medium-high heat. Add the zucchini and sautee 1 minute. Add the asparagus and sautee until beginning to brown. Salt and pepper to taste. Remove to a plate. Add 2 tsp. oil to the pan and put back on the heat. Add the capers and sautee until they start to pop. Add the lamb, preserved lemon and thyme and sautee until browned at the edges. Serve on top of veggies with a sprinkle of fresh parsley to set the dish. Brown the lamb on all sides in a large skillet brought to screaming hot over high heat. Add to a crock pot with the vegetable stock. Cook on low 6-7 hours or until fork tender and delicious.